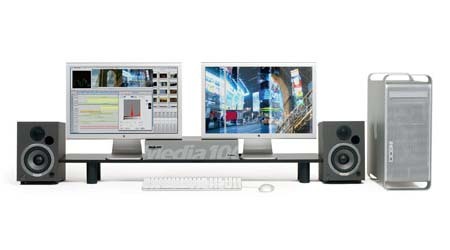 TimeLine Designs offers the new Media 100 HD line of editing systems, now running on Intel based Macs. We also continue to offer service and support on all earlier Media 100 systems. We understand your business and can help you make money with Media 100. Our business? We offer turnkey cost effective, custom configured, ready to edit Media 100 NLE systems. Just plug it in and edit! Our featured product: The new Media 100 HD product line. Click here to see why you should be moving into HD (High Definition), even if your business is still SD (Standard Definition). Start with a FREE version of the software that even allows you to edit with the familiar Media 100 interface on your laptop! Do you need a familier Media 100I system to match an existing system? We can still provide refurbished 4:3 SD M100i XS and XR systems with optional SDI and DV. Turnkey prices start at $4000. System above shown with 1TB (1000 GB) of media storage. Click here to look at our refurbished Media 100i systems available in OS 9 and OSX with a G4/1.25GHz dual boot Mac. Upgrading your existing or Legacy system? Look at our line of SCSI or IDE storage systems. Or, Click here for a list of useful System Components. There is a lot of life left in your system with our performance accessories and continuing telephone support. Need help with your Media 100 system? We offer support for all models, Legacy to new. We are recommended on Media 100's website. Selling your Media 100 XS or XR? Too bad. Contact us, we might buy it.